This is a question you’ve probably been asked many times at your regular dental visits, and for good reasons. Flossing is very important to maintaining oral health because it removes plaque and bacteria that a toothbrush cannot reach. This is common knowledge, yet so few people floss on a regular basis. Common excuses for not flossing are, “It hurts when I floss,” “My teeth are too close together,” and “I never get food stuck in my teeth.” The reality is, if you are flossing correctly and using the right kind of floss, these excuses will no longer apply! If your excuse for not flossing is, “I never get food stuck in my teeth,” you might not understand the main objective of flossing. While flossing does remove noticeably annoying food particles that get caught between your teeth, the main purpose of flossing is to scrape away the thin film of bacteria that collects on the teeth during the day. Between the teeth and the gums is a small pocket that easily traps bacteria and is difficult to reach with a toothbrush. As you scrape the floss down the side of each tooth and gently down into the gum pocket, you remove a film of bacteria that would otherwise linger and eventually cause plaque buildup. Insert the floss between two teeth. Slowly place the floss beneath the gum line at the base of one tooth. Curve the floss around the tooth, and scrape it along the edge of the tooth. Repeat step 3 in the same space between those teeth, but scrape the floss against the neighboring tooth, making sure to go all the way to the base of the tooth beneath the gum line. 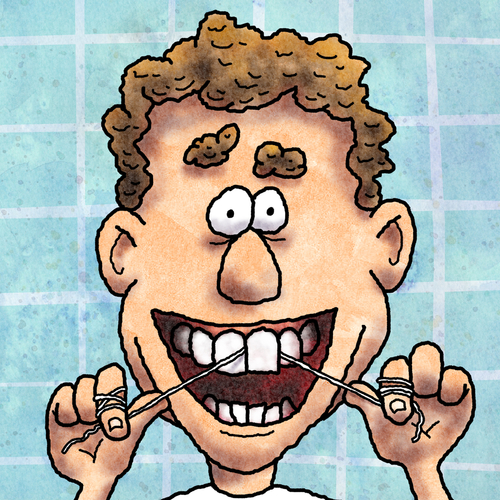 Repeat steps 1 through 4 between each two teeth using a clean section of floss each time. This prevents transferring bacteria to neighboring teeth. 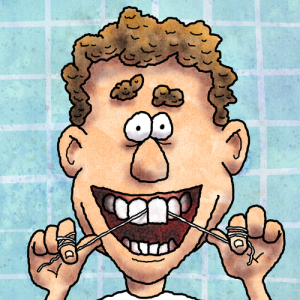 If your teeth are very close together or if you have braces, flossing might be a little more challenging. Try waxed floss, glide floss, or use a threader that is made to get around the brackets of braces. If your floss shreds, you might have a problem with your dental work, or you could have a cavity. A visit to your dentist can help to identify the problem. If you are interested in general or cosmetic dental services offered by Dr. Kevin B. Sands, please schedule your appointment today. Call 310-273-0111 or fill out our online contact form for more information. This entry was posted on Friday, November 21st, 2014 at 2:21 am	and is filed under Dental Care, Dental News, Flossing, Oral Health. You can follow any responses to this entry through the RSS 2.0 feed. Both comments and pings are currently closed.